The latest chapter of Chicago's rich architectural history. One Bennett Park will grace Chicago’s captivating skyline taking its place among the city’s most luxurious residential towers. Its designer, Robert A.M. Stern Architects, deemed a "portraitist" whose buildings capture the soul of the city in which they are built, has extended this legacy into the 21st century. With a thoughtfully conceived park by Michael Van Valkenburgh as its front yard, One Bennett Park sets a new benchmark for residential living with luxury residences ranging from two to four bedrooms. From the masterful layout of the park to the sublime satisfaction of each residence, the level of design, craft, and workmanship is unsurpassed. Carefully placed windows frame artful portrayals of the city and lake, revealing a newness to the familiar, every day and every night. Condos in One Bennett Park are nothing short of revolutionary. 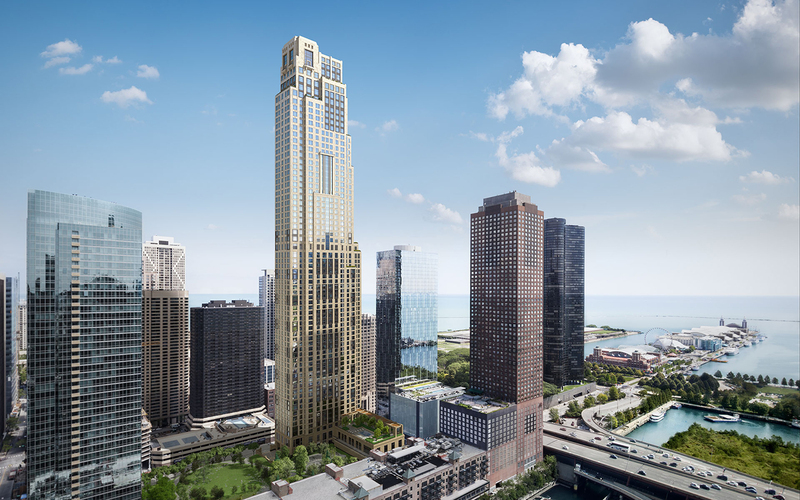 Developed by Related Midwest and designed by Robert A.M. Stern, this breathtaking 70-story highrise building will bring 348 stunning luxury units to the Chicago condo market. The expected completion date for these residences in 2019, but the listings are selling fast. There are 9 different floorplans ranging in size from 1,737 Sq. Ft. to 5,130 Sq. Ft. The development also includes 1.7 acres of new parkland in the heart of the city, featuring expertly crafted gardens and paved walking trails. Located in Streeterville, close to Navy Pier, Lake Shore Drive, Lakefront paths and Yacht Club, this exceptional condominium is the epitome of refined living in Chicago!